Posted on September 21, 2018 at 8:27 pm. In a recent article in the Nation, John Nichols reports on the most recent instance of obstruction of justice perpetrated by Donald Trump. As Nichols reports, Donald Trump and his administration are seeking to force the declassification of documents and text messages that are relevant to the inquiry into Russian influence on his campaign and his presidency. Since taking office, President Trump has repeatedly attempted to interfere with congressional investigations into his conduct and that of his administration. His attempts to obstruct justice are well documented and ongoing, and this most recent example only seeks to strengthen the case for Congress to begin impeachment proceedings. Nichols compares Trump’s actions to that of Richard Nixon, who resigned before he could be impeached. In Nixon’s time, Republicans joined Democrats in moving to hold a Republican president to account for obstruction of justice. These are different times. But there can be no excuses for members of Congress, no matter what their partisanship, who fail to recognize that the impeachment power exists to address precisely so lawless a presidency as that of Donald Trump. John Nichols is right. This is not an issue of partisanship. The impeachment power exists for this very reason and both Democrats and Republicans must stand in support of the Constitution. Posted on August 31, 2018 at 3:07 pm. In an article in The Nation, John Nichols discusses support for impeachment investigations by Republican leaders. Citing recent pieces by Representative Jason Villalba and former New Jersey governor Christine Todd Whitman, Nichols points out that Democrats aren’t alone in their call to hold Donald Trump accountable for his many constitutional violations, despite common expectations of party loyalties. Republicans have put America first before, most notably during the Watergate crisis, when a number of Republicans on the House Judiciary Committee supported articles of impeachment against President Richard Nixon. Nixon quit after top Republicans—including conservatives such as former Senator Barry Goldwater of Arizona—told him that if he remained in office he would be held to account. Nixon was a bad player, to be sure. But Trump is worse, and a new generation of Republicans is called to check and balance him with the remedy that the founders outlined in the Constitution. Most Republicans will continue to resist the constitutional remedy, for now. But the fact that the discussion of impeachment is beginning to cross partisan and ideological lines represents a slim ray of hope for the republic. John Nichols and members of the Republican leadership speaking out for impeachment proceedings are right. The nation must come together, regardless of party, to end this constitutional crisis and to begin an impeachment investigation of Donald Trump. Posted on August 24, 2018 at 4:40 pm. Free Speech For People Legal Director Ron Fein joined Congressman Al Green and Democracy Now to discuss the latest in the legal case for Congress to begin impeachment proceedings against Donald Trump, including illegal hush money payments made in violation of the Federal Campaign Finance Act at the request of Trump, per Trump’s personal attorney, Michael Cohen. Cohen confessed to the payments while pleading guilty to breaking campaign finance laws and a number of other charges. Posted on August 15, 2018 at 4:51 pm. 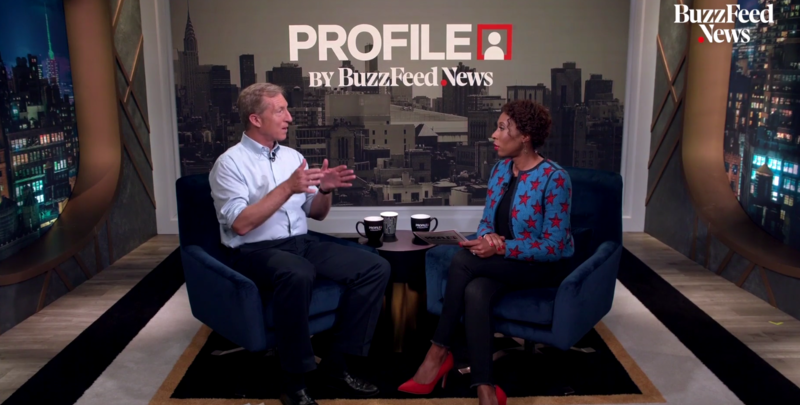 In an interview with Audie Cornish of Buzzfeed News, Tom Steyer discussed the grounds for impeaching Donald Trump. Steyer focused on Trump’s corruption, citing his numerous violations of the emoluments clauses of the Constitution. “If you step back for one second and think about this president, the most corrupt president in American history — [he’s] somebody who is breaking the law on a daily basis, somebody who is reckless and dangerous and lawless. In the Constitution, it says that the president cannot take any payment whatsoever from a foreign government — for obvious reasons. I mean, you can’t have the president taking money from a foreign government, which would mean that he might … do what’s right for them instead of what’s right for the American people. He does that on a daily basis. …Steyer said ‘corruption’ — rather than the Russia investigation or any policy move — provided the strongest rationale for impeachment, according to a previously undisclosed survey of 200,000 people on his expansive Need to Impeach database. The survey found that 30% of respondents said the president should be impeached for corruption, he said. Tom Steyer is right – Trump’s ongoing corruption and constitutional violations constitute enough evidence to call on Congress to launch an impeachment investigation. We must act now to impeach Donald Trump. Learn more about how you can get involved here. Read the article from Buzzfeed News here. Posted on August 13, 2018 at 3:10 pm. Jessica Kwong of Newsweek discusses the new book, The Constitution Demands It, and the case for beginning impeachment proceedings against the President. Click here to read the full article in Newsweek. Click here to learn more about the new book, The Constitution Demands It!